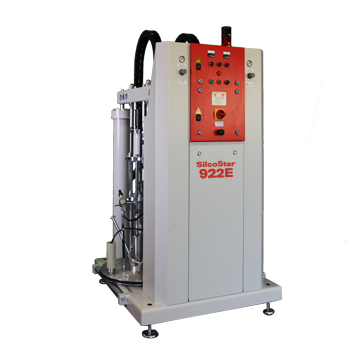 The 902E & 922E systems are well proven and robust metering systems for the processing of LSR materials directly from the supplied 20 litre pails (902E) and 205 litre drums (922E). The systems are hydraulically operated with like sized metering pumps linked through 2KM innovative drive system. This coupled with efficient, balanced metering pumps give the system a fixed 1:1 volumetric ratio the processing of high viscosity materials. The units use flat follower plates and pneumatic ram presses to ensure the material is processed free of air and always on ratio. New features for 2016 include; pressure transducers to replace manometers, faster more powerful PLC and new “LSR family” design for the 922E (pictured).